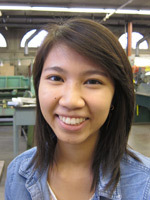 We caught up recently with Benson High School alumna Elizabeth Ma, who has worked part-time for Blount International this year as part of Oregon’s Youth Apprenticeship Training Program. She graduated from Benson in June and said she’s heading off to Portland State University this fall to study mechanical engineering or computer science. She said her experience with YATP may have helped her win a substantial college scholarship to PSU — and has given her invaluable career experience. Ma said she learned about everything from the basics of fixing assembly machines to better time management. She also gained perspective on the advanced manufacturing industry, which has a diversity of jobs requiring technical skills, teamwork and problem-solving ability. One of her classmates, Jesse Soria, also worked at Blount International as part of YATP. He’s looking at Portland Community College and other options for continuing his education and developing his understanding of electrical systems. YATP is a state-approved program that PWA helps make possible. It allows select Oregon students under 18 to work in facilities alongside skilled craftsmen, including millwrights and electricians. Students gain work experience, learn skills and can earn more than $12 an hour. Learn more here.